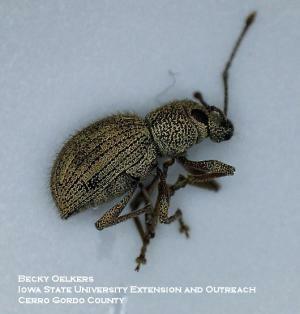 The imported longhorned weevil, like its close relative the strawberry root weevils, is a common "accidental invader" that crawls into houses and buildings from outdoors by mistake. The weevils are harmless; they do not damage the house or furnishings; they can not bite or sting people or pets. They are merely a nuisance by their presence. The larvae of the imported longhorned weevils live in the soil and feed on the small roots of many different plants, including aster, clover and turfgrass. They do not cause apparent damage to the plants and control of the larvae in the soil is not practical nor necessary. Some of the invasion by longhorned weevils can be prevented by exclusion techniques that close their routes of entry. Look for and seal cracks and gaps through which the adults can crawl into the building. Spraying a residual insecticide labeled for beetle control outdoors on and along the foundation and in outdoor areas of weevil abundance may be of some benefit. For more information on insecticides please see this article. showing the characteristic "light bulb" shape. Adults already inside need only be vacuumed or swept up and discarded. 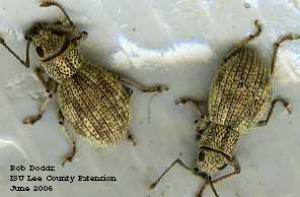 Household aerosol insecticides are not very effective for controlling these weevils.